There is widespread opposition to internet censorship in emerging and developing nations. Majorities in 22 of 24 countries surveyed say it is important that people have access to the internet without government censorship. In 12 nations, at least seven-in-ten hold this view. Support for internet freedom is especially strong in countries where a large percentage of the population is online. And, in most of the countries polled, young people are particularly likely to consider internet freedom a priority. These are among the main findings of a Pew Research Center survey conducted among 21,847 people in 24 emerging and developing economies from March 3, 2013 to May 1, 2013. All interviews were conducted face-to-face. Opposition to government restrictions on the internet is especially common in several of the Latin American nations surveyed, including Venezuela, Chile, Argentina, Brazil, Mexico and Bolivia. It is also widespread in the Middle Eastern nations of Lebanon and Egypt. Support for internet freedom tends to be strong in nations with high rates of internet penetration, such as Chile and Argentina, where roughly two-thirds of the population is online. It is less common in nations with lower penetration rates, like Indonesia and Uganda. Some nations, such as Venezuela and Egypt, have higher levels of support for internet freedom than might be anticipated, given the degree of online penetration in the country. Meanwhile, support is lower than might be expected in Russia and Pakistan, given the percentage of people who use the internet in those two nations. Other Pew Research surveys have also found relatively low support for democratic rights and institutions in Russia and Pakistan.1 Another caveat in interpreting the results for Pakistan is that a large percentage of respondents (62%) offer no opinion on this question. Opinions are also strongly related to age. In 14 nations, people ages 18-29 are more likely than those 50 or older to believe an uncensored internet is important. Age gaps of 20 percentage points or more are found in Russia, Lebanon, Tunisia, Bolivia and Senegal. These age differences suggest that support for internet freedom will only become more widespread with the passage of time. Nonetheless, people ages 50 and older do tend to support internet freedom. In most countries surveyed, a majority of this age group says having internet access without government interference is important. 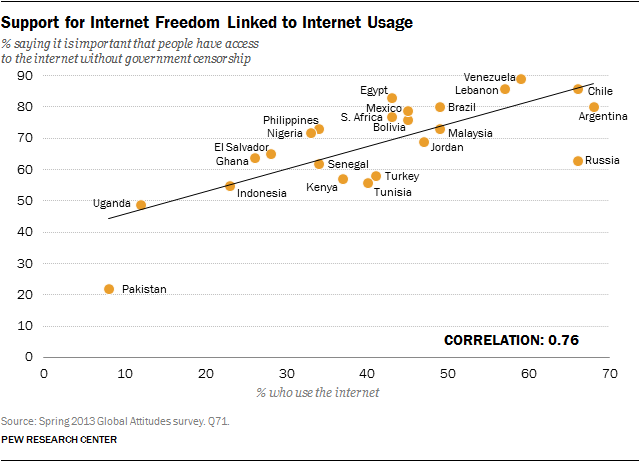 In several countries, internet freedom has especially strong backing among the well-educated. For example, 73% of Tunisian college graduates say it is important to have internet access without government censorship, compared with 54% of those without a college degree. Double-digit gaps are also found in six other countries. And in several nations, those with higher incomes are particularly likely to consider this a priority. For instance, 71% of high-income Kenyans say internet freedom is important, compared with 44% of people in the low-income category. Nearly eight-in-ten Russians in the high-income category (78%) believe it is important, while only 52% of those with low incomes hold this view.